See the best of the Spanish capital on an independent GoCar tour of Madrid! Simple, fun and easy to drive, GoCars are fitted with GPS navigation systems for accurate directions around the city, so you can easily find Madrid’s top sites. The GoCar is a cool, easy to drive and unforgettable way of sightseeing Madrid. 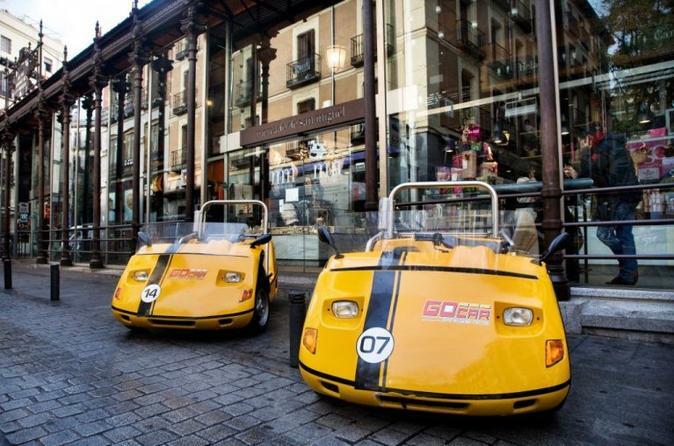 In the GoCar, you will get to tour, explore and stop wherever you want and see everything Madrid has to offer. There are a number of GPS Guided Tours (TM) that you can choose from. Take one, or take them all!! The best thing about taking a tour in a GoCar is that you are in control. You can to stop where you want, see just the sights that interest you, plus take as much time as you need, all in the language of your choice. Your self-drive GoCar tour, guided by GPS, is the most fun way to explore Madrid at your own pace. The talking GPS gives you directions that are clear, concise and informative, and it highlights specific locations throughout Madrid as you drive, providing a memorable experience during your time in the city. Your three-wheeled GoCar seats two and has a lockable trunk for your belongings. No experience is necessary, and you will receive helmets and a briefing on how to operate the car safely before you head out from the shop. Unlike a traditional tour, you decide where you want to go and when you want to stop. Your tour can take anywhere from one hour to three hours – the choice is yours. Simply get your car, choose a designated route or make up your own tour of the city, and let the fun begin! Either combine the itineraries on the 1-hour and 2-hour tour, or combine the 2-hour tour itinerary with a visit to a famous Madrid famous soccer stadium. Simply choose on the day! If you decide to see a soccer stadium, then choose between Santiago Bernabeu Stadium -- home of Real Madrid – or Vicente Calderón Stadium, where the rival Atlético Madrid team play.